Jump to Save the World: Notes. - Jump to Battle Royale Notes. 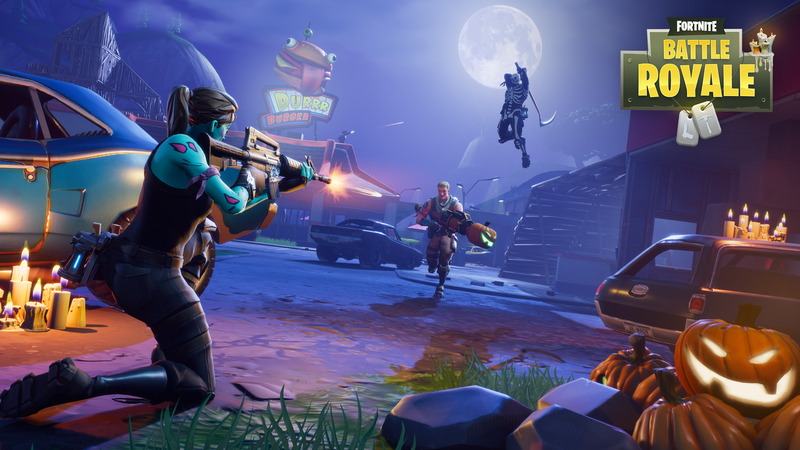 Welcome Fortnite fans to our biggest (and eeriest) patch yet with creepy new content for both Save the World and Battle Royale players. Plus big new customization features for Battle Royale! 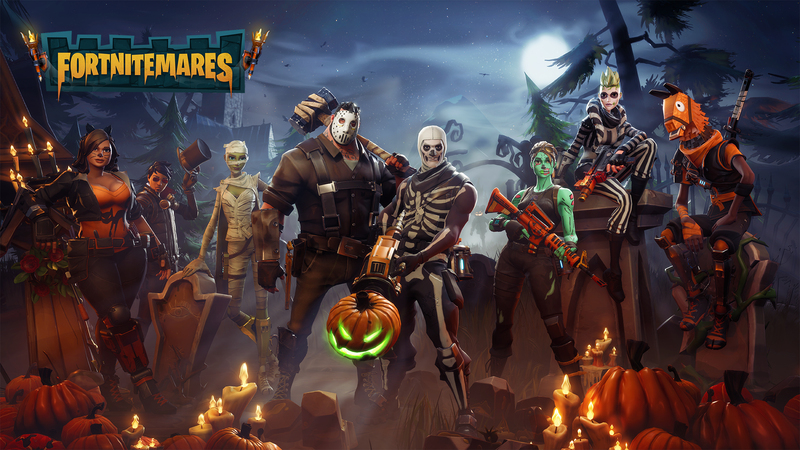 Celebrated by all Fortnite players, the Fortnitemares update introduces all kinds of new terrifically terrifying Halloween content on Oct 26th. Seasons will give each player a chance to level-up their character and earn unique seasonal rewards and banner flair. Explore a new and unique array of outfits, gliders and pickaxes in the item shop. Use V-bucks to purchase cosmetics in the store! Players can customize their character’s appearance, choose their banner and equip any purchased cosmetics in the Locker. Greatly reduced input latency on PlayStation 4 and Xbox One. Controls overall should feel more responsive on consoles. We’ve re-enabled capped 30 FPS on PS4 and PS4 Pro to maintain a smooth experience. Added an option to toggle targeting. Players now have the option to press their “Target” button once to enter and leave the targeting state, and will no longer need to hold down if toggle targeting is enabled. 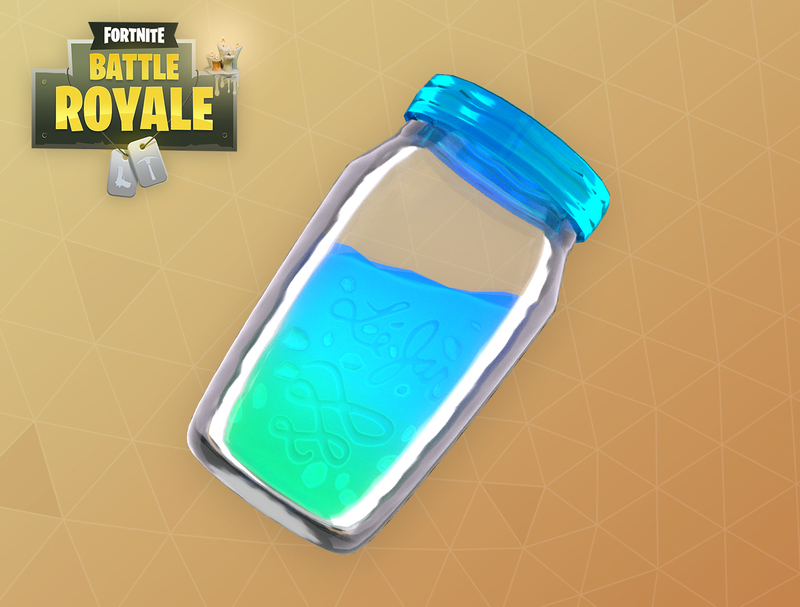 Introducing “Slurp Juice,” a regeneration potion that grants 1 health and 1 shield per second for 25 seconds. 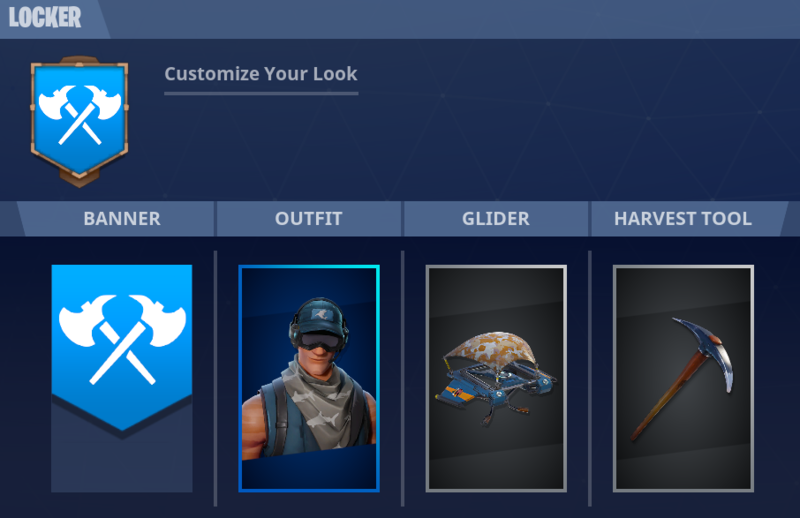 You can now customize your character, banner, and equip any cosmetics in the new Locker menu. Settings have been reset for all players. This is a side effect of the setting changes we made in this update. We will work on improving this process for future updates. Players will now auto-pickup ammo, building resources, and traps. New graphics are visible to players who are caught outside the Storm safe zone, and the storm wall visuals have been updated. New Halloween skins are on sale in the newly implemented store, and will only be available until 11/4. Use V-bucks to purchase items from the store. The new “Combat Pro” controller config is aimed at keeping the user's thumbs on the sticks as much as possible so they can make fast weapon swaps and build quickly. Slurp Juice is a regeneration potion that grants one health and one shield per second for 25 seconds. Slurp Juice can heal players all the way up to 100 health. These can be found in the same locations as other consumables and you can stack up to two of them. 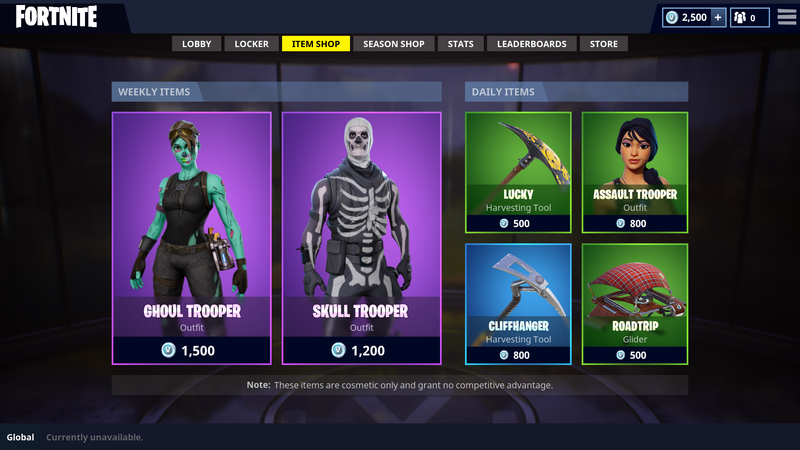 Players can now purchase a unique array of outfits, gliders and pickaxes in the new item shop. NOTE: Purchases from the Battle Royale store do not carryover to the Save the World mode. A division is a group of 50 active players competing against each other to see who will take top the spot. You are automatically assigned to a new division each week. Each match type (Solo, Duos and Squads) gets its own separate division. 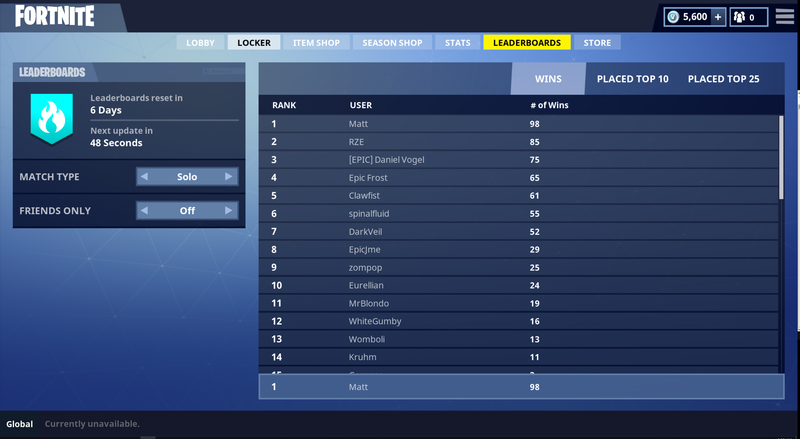 Compare yourself to your friends by turning on "Friends Only" on the leaderboard screen. All leaderboards reset weekly on Wednesdays. Only players on your platform are included in the rankings. Expect improvements in upcoming releases. Seasons will give the player a chance to level-up their character and earn unique seasonal rewards and banner flair. The first season will give players a chance to level up to 100, with player level displayed on their banner. Banner flair is awarded in levels 2-49, giving players an additional way to show off their mastery. Players can boost their seasonal levels by participating in Daily Challenges. Tis’ the season to be scary! 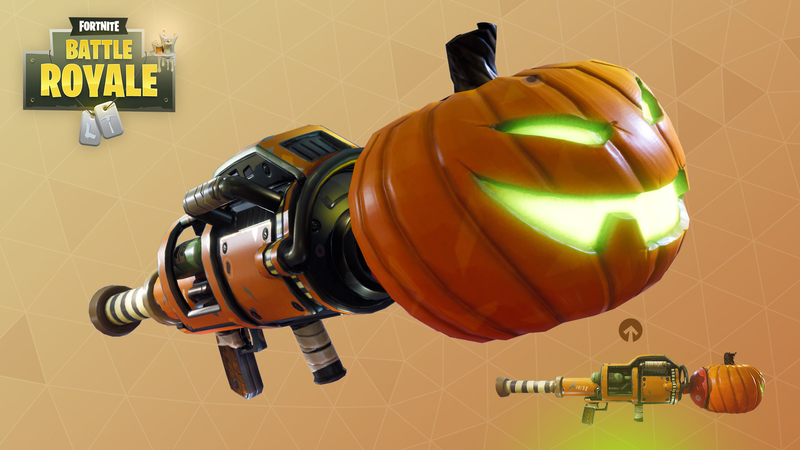 The Rocket Launcher now has a creepy cosmetic variant to celebrate Halloween. Players caught inside the Storm zone may be in for a fright! New effects and visuals make for a much more intense experience. The Storm wall has been updated as well. Run to safety! The new “Combat Pro” controller config is aimed at keeping the user's thumbs on the sticks as much as possible so they can make fast weapon swaps and build quickly. We're trying to add a familiar feel for shooter players, placing the map as a button in the middle of the gamepad and taking crouch off a bumper button. Access the new controller config from the “Controller” tab in the settings menu. Be sure to select the “Apply” button to save the change. Added auto-pickup for ammo, building resources, and traps. Your player will loot these items automatically when walking over them. Note that dropped items will not be automatically picked up, but you can still manually pick them up. Reduced Supply Drop balloon health from 2000 to 1250. Items which are spawned from treasure chests or ammo boxes are now less likely to be clustered together. Reduced the chance of Storm safe zones appearing at the edges of the island. Fixed supply drops not falling from structures in various cases. Fixed a bug which caused stacked items not to automatically add to the quick bar when picked up. Common/Uncommon damage increased from 11 to 12. Rare damage increased from 12 to 13. Decreased reload time by 15%. Sniper Rifle projectiles now leave a visual trail behind. Reduced accuracy penalty while moving. Does not affect Burst or Scoped variants. Updated visuals while zoomed in. Tracer effects and smoke now match the weapon’s behavior. Fixed an issue which caused the transition from the hip fire position to targeting to rotate the player cam downwards. Fixed an issue which caused recoiled weapons not to recover if you began reloading while recoiled. Aiming sensitivity on controllers now scales with your weapon’s zoom, similar to how it does with the mouse. This change replaces the previous sensitivity adjustment we made to scoped weapons. Changed some default keyboard bindings for quick slots. The 4th quick slot has changed from the Z key to 5. The 5th quick slot has changed from the X key to 6. Improved analog stick responsiveness when rotating the camera. It should now be easier to make fine adjustments to your aim on controllers. Improved how interactions such as teammate revives, pickups, and opening doors are prioritized when there are multiple possible options. Smoothed out the camera transition between riding the Battle Bus and beginning to skydive. Added more loot to the area with containers south of Tomato Town and shifted the containers to better align with the building grid. Fixed issues where grass could be hidden on certain types of terrain. Various fixes for terrain seams and floating objects. Fixed some objects that were previously indestructible. Voice Chat now works while spectating teammates and after the match ends. Decreased the distance players can hear ceiling and wall trap audio. Added ambient “zap” audio to placed wall traps. Fixed issue which caused footstep audio to be drowned out while other sounds were playing. Fixed an issue which could cause footstep sounds to trigger multiple times per step. Added several new ways to access the Item Shop, Locker and other new features. Added a “Season Shop” tab. This is a preview of a feature still in development, that will be implemented in a later update. Changed how the “Message of the Day” news is displayed. This message now pops up before you enter the matchmaking lobby, but only if there is new information added since the last time you saw it. Improved the look and feel of the “Stats” interface. Adjusted rarity color for consumable items. The chances of finding these items in chests or in the world remains unchanged. Shield Potion is now blue (Rare). Added a highlight background behind the currently active building resource. The menu can now be opened while spectating. Resources can now be dropped while using a controller. Removed “Show Grass” from the Options menu in Battle Royale. Grass and foliage is always intended to be visible. Fixed an issue which caused your weapon to continue firing after opening the fullscreen map. Fixed an issue which caused the final damage done to an enemy not to display hit effects. Fixed an issue which caused the reticle to remain faded out after reloading or when out of ammo. Trees and foliage will no longer cause very low frame rates when Material Quality is set to anything lower than High. Implemented profile guided optimization to help overall CPU performance on consoles. Improved thread affinities on console to help overall CPU performance. Reduced hitching issues on all platforms. Fixed grainy visual artifacts on trees with certain graphics configurations. Selecting a party member in the lobby will display an incorrect banner. Other player's gliders may appear lopsided if a glider cosmetic is equipped. Slurp Juice could be found and consumed in the pre-game staging area, which resulted in 25 shield carrying over to the actual match. Trap the Storm! This new mission focuses on reinforcing and defending existing buildings. Fortify your castle, and prepare for a close combat husk brawl. Dig into Hexsylvania’s cryptic history with bone chilling story quests! 36 new quests in all. Adventure into the mists of Hexslyvania after completing Storm Shield Defense 3. Beware the Pumpkin Head Husk, a nightmarish creature guaranteed to scare you out of your gourd. Protect ya neck! The Vampire Taker is out for blood. His attacks heal him, and some say he can’t be seen on the mini-map. Spend the candy you earned by completing quests and mission alerts on Halloween llamas for extra Fortnitemares fun. 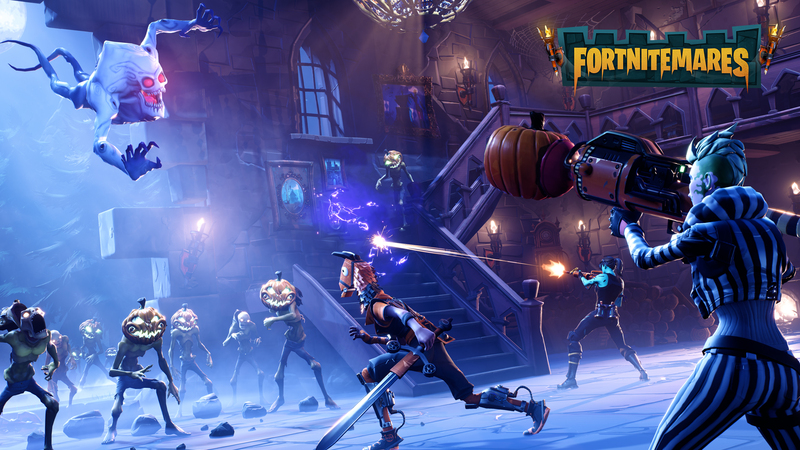 Slot Fortnitemares Cosplay Survivors into your Collection Book and receive event rewards! Witness the Lobby of Doom! 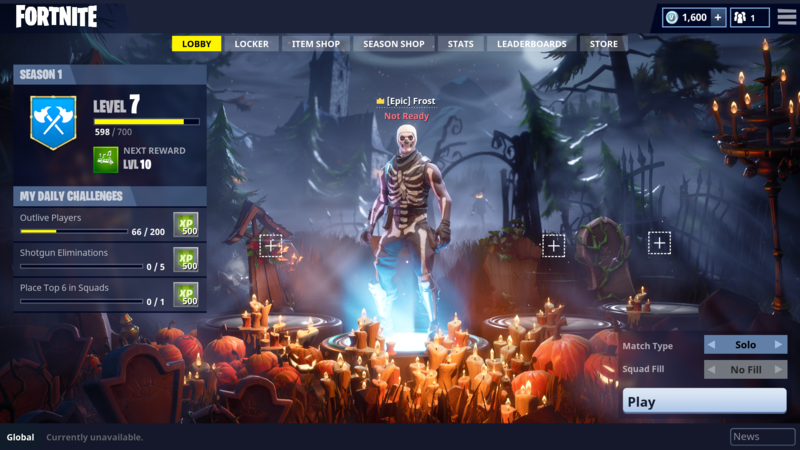 Behold the crawling terror of the updated Fortnitemares themed lobby. Eight of our Heroes have gotten into the Halloween spirit, and have dressed up for the event. Show the hordes of husks they have something to be afraid of this Halloween with the Jack-O-Launcher, the new pumpkin slinging Husk slayer. Only available for a limited time. 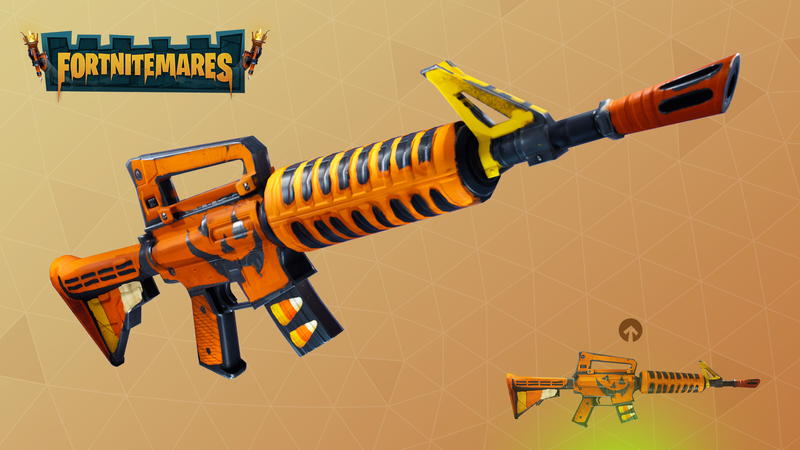 The Grave Digger is a new assault rifle included in the Fortnitemares update. Packing a serious punch and sporting an extended clip, this weapon is perfect for laying hordes of Hexsylvanian Husks to rest. Heroes, Defenders, Leaders, Workers, Schematics and Transform Keys get a new unique look. New and improved Defender Interface. Players can now choose weapons and ammo for Defenders all from one menu. All item XP has been replaced with rare or better items, valuable resources, or Upgrade Llamas. You will receive Upgrade Llamas at a higher rate than the new login rewards. You will be retroactively rewarded with Epic and above rarity items that have been added for any days you’ve already collected. Significantly reduced input lag on both PlayStation 4 and Xbox One. Improved the readability of text and the clarity of icons across the user interface. The Horde Bash event has ended! For every unspent 1,000 Scavenger’s Tickets you will automatically receive a Scavenger Llama available in the loot tab. Turning off the Horde event will cause the Current Daily Llama to be reset at 4am during the downtime compared to the normal 8pm. Make sure to get those Llamas before it’s too late! Changed the “Leaping Ninjas” Mutant Storm Modifier to apply AoE damage when a Ninja lands after using the Mantis Leap ability. This ability still has reduced stamina cost, but the modifier no longer increases the Ninja’s jump height. These tires can be dropped from up to 3 tiles above your foes, oh, and they bounce! Place this on the ground to slow and freeze enemy monsters’ movement in place. Particularly effective against Fire elemental enemies. Overall outcome is a +7.5% buff to all reload speed alterations. Hero cards feature a new, unique animation in the card background rarity art. Defenders have a much clearer, larger image of the weapon they use. Transform Key visuals have been completely redesigned to be rectangular, and have unique visuals. When matching Personalities and Set Bonuses, the icons glow brighter. Added type icons to cards at larger scales so the type is easier to identify. The Fire Cracker Pistol projectiles will no longer instantly explode if near a Radar Tower. Fixed an issue which caused traps to sometimes ignore enemies in range. Fixed an issue that was causing Defenders to be unable to be transformed without using overly high rarities. Fixed an issue that was causing damage-over-time effects dealt by elemental lightning Husks to affect player’s health as well as shields. Fixed an issue that caused Husks to take fall damage when attacking Amplifier A from the North in Canny Valley Storm Shield Defense missions. Fixed a bug which interfered with hit reaction animations playing properly on husks. Fixed an issue which caused radar dishes to be destroyed when upgrading a floor under it. Fixed an issue which caused defenders using a pistol to keep reloading after firing a single shot at Flingers. 8 new Halloween Heroes have been added. Bloodfinder A.C. is a Legendary hero earned exclusively by completing missions in the new Hexsylvania region. Completing your collection of Fortnitemares Cosplay Survivors. Playing through the Hexsylvanian quest line. The Energy Thief Ninja and Machinist Harper now correctly show their role name in the subcategory of their hero card. Reworded descriptions of Recycling and Hyperthreading perks for clarity. Changed "harvesting damage" to "pickaxe damage" in the Deep in the Zone perk description. Fixed an issue which caused enemies to attempt to attack Shock Towers. Fixed an issue which granted the Exit Plan perk multiple times from overlapping BASEs. Fixed an issue which caused an incorrect ammo display to briefly show up when activating Goin Commando. When a card is ready to upgrade, a glowing yellow indicator will appear by the XP bar, and Stars will glow when an evolution is available. We removed up arrows on larger card sizes and added them on smaller sizes. The horizontal card shape for schematics have been changed to a vertical shape. Our intention is to unify the shapes of cards across the game, making the images of Weapons and Traps a bit larger, and giving them more character. Added a new quest map for the Fortnitemares event. We have made a number of improvements to the way defenders are summoned and the UI that supports this process. Players can now summon defenders with a choice of weapon (and ammo) directly from the defender screen. Players can still drop a weapon and ammo on the ground for the defender to pick up if they choose to do so. PC players can now hover over mission tiles to see additional details. In the inventory screen, the active details tab is no longer tracked independently for schematics and backpack items. Added missing subtitles for Canny Valley Storm Shield Defense 1. Added clearer messaging for Upgrade Llamas. Now a player is told they will get a rare OR a hero drop. When opening an item management screen with no item selected, the item details panel will no longer show stale information from another screen. Trap knockback stat display now includes changes from alterations. Corrected the Scavenger Pipe weapon description. Was previously referred to as a Socket Wrench. Restored the count that appears on a stack of traps when recycling more than one. Improved scrolling with a controller on the Play frontend tab. Fixed an issue which caused the Helicopter slot 2 unlock to become available before the Helicopter unlock. The Helicopter node in Research Tree 2 was swapped with the Hang Glider node in Research Tree 4. This fix may cause some players to have parts of their research skill tree reset and refunded. No progress will be lost but players will need to rebuy their skills again with their refunded points. Fixed an issue that caused a Weapon Llama obtained from the collection book to visually appear as an Upgrade Llama. Fixed an issue that caused survivor squads to show incorrect information when removing each slotted survivor. Fixed cut off text in the Mission Select screen for a number of languages. Fixed a few typos in the Supply Drop Upgrade Wood skill tree node description. Fixed an issue which caused other player’s health bars not to show after rejoining a mission. Fixed an issue which caused party invites and notifications to stop appearing. Updated the Defender tutorial to work with new UI. Fixed an issue which caused floating lights to be present in the Plankerton Storm Shield. Fixed an issue which prevented players from completing the track in “Deliver the Bomb” missions. Fixed an issue which did not automatically complete the grenade objective if players missed the grenade target three times during grenade training. With this issue now resolved, players should be able to advance through the tutorial correctly. The blue background on Schematic Cards has been changed to a lighter color. Added a sensationally spooky cinematic to introduce Fortnitemares. New model and animation set for the Taker. Fixed an issue with the way Tail of the Dragon particle effects displayed on other players' game clients. We have created a new, distinct visual style for Heroes, Weapons, Schematics, and Survivors. Fixed several issues that were causing in-game hitching. Healing pads can still work even when at 0 durability. The mouse cursor is sometimes invisible on PS4.